A portfolio is defined as a collection of projects, programs, and operations that are grouped together for the sake of better management. The components that make up a portfolio may or may not be interrelated or interdependent but are managed together to meet strategic objectives of the organization. Portfolio and Project Management can often be mistakenly viewed as interchangeable. Project management is concerned withinitializing, planning, implementing, and controlling a specific set of activities to complete a set of objectives. At which time the project is closed.A project, and project management, is concerned with the delivery of specific capabilities or deliverables. 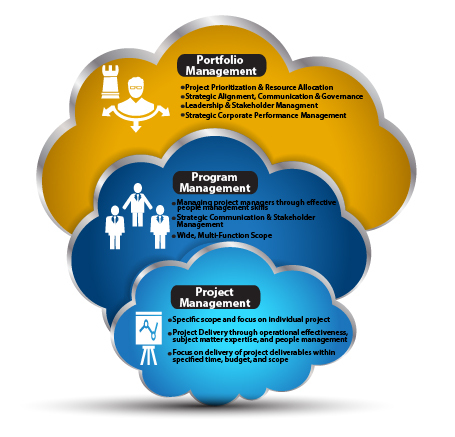 The essence of Portfolio Management, known as Project Portfolio Management, or PPM, is that a portfolio concerns multiple projects. The objective of PPM is to coordinate resources and project schedules to optimize their benefits and reduce conflicts between them.The portfolio management seeks toensure that human resources, capital, and time are used to accomplish all member project objectives as efficiently as possible, identifying strengths, weaknesses, opportunities, and threats in prioritizing, managing, and controlling a group of projects to achieve strategic business goals. PPM, because it deals with multiple projects and programs even as they come into existence, run their course, and close, is an on-going entity within the organization. Portfolio management aligns organizational strategies by selecting the bestprojects and programs, prioritizing them, and providing the necessary resources to performthe work. It is a process that clearly distinguishes and balances conflicting demands between individual projects, programs, and objectives, considering both risk and reward. 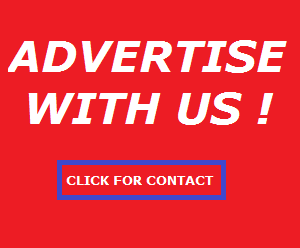 Interest – Does it garner interest from the organizational point of view? Practicality–Arethere any common project possibilities? Is the organization capable of completing the project? Are all the necessary resources and technical skills available? Value–While a number of projects may be viable and generate interest, actual execution of a project depends on a detailed analysis of the proposal’s valueto the organization. Does this project add more value to the organization than any remaining option? Good communication is one of the mainstays of a successful organization. Multiple projects running without good communication among them creates a business and operations environment that is bound to be less efficient—more prone to error and wasted effort due to duplication and conflicting objectives. When projects are organized into groups, or portfolios, the portfolio manager is in a position to view the broad picture. He or she will be able to see synergies to be taken advantage of and conflicts to be avoided. The portfolio manager, in a sense, is playing a game of chess, moving the pieces, or projects, around the board to make the best use of each of them with regard to all others. At times, he or she may see that a particular piece, project, should even be sacrificed for the benefit of all others. Without a coordinated approach to all projects, this opportunity may be missed, leading to wasted resources. Success lies along a narrow path strewn with risk. But risk on one side of the scale has to be balanced with opportunity on the other;it is a rare thing for either risk or opportunity to arrive at the door unaccompanied by the other. With wise portfolio management, the manager has a better view of related risks and opportunities than does the project manager. He or she has more information to enter into the decision-making equation, thus is able to make a more holistic decision to steer the enterprise toward its objectives. Using portfolio management, it is easier to see existing policies, programmes, or projects that are not aligned with organizational strategy. These may have to be re-aligned or even terminated, but without taking a broad view, it may be impossible to see the problem or make the best decision concerning a project’s final disposition. Resources are finite—only the most valuable opportunities can be pursued.This is especially true in today’s environment where change happens at an increasingly rapid pace and seemingly small decisions can have significant impact. Organizations are also growing in complexity and size. The old way of thinking vertically, the “silo” approach, is no longer adequate. Organizations today are broad-reaching, so that without portfolio management to coordinate projects in a dispersed organization, problems as well as opportunities may very easily be missed until it is too late to avoid the one or take advantage of the other. Successful portfolio management consolidates the information and energy of multiple, seemingly unrelated, projects to find and exploit their relationships. As with “the butterfly effect,” where a butterfly flaps its wings in Australia, creating a disturbance that eventually causes a hurricane in the Caribbean, we find that there really is no unrelated project. 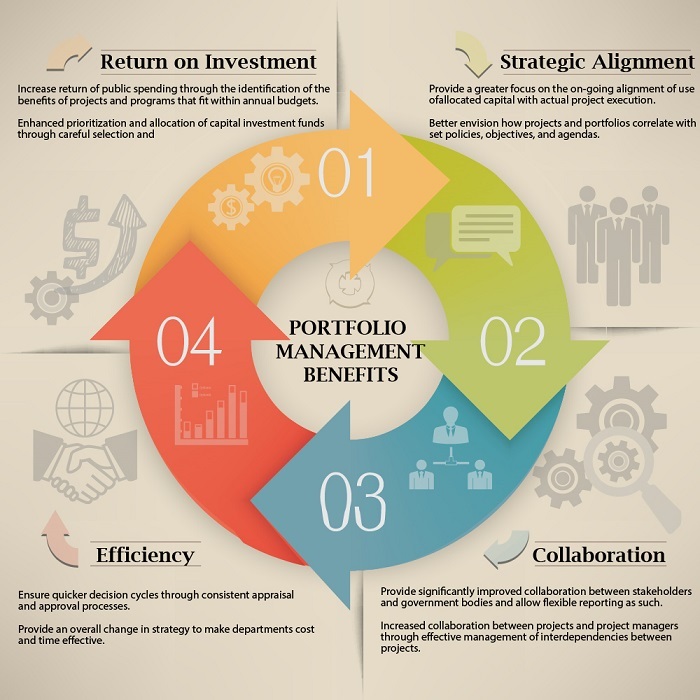 Skilful portfolio management discovers and capitalizes on the relationships among projects to increase their return on investment and absolute value to the organization. As project managers and business owners realize the need to improve in a competitive, cost-conscious, risky environment, the need for effective tools that allow them to better manage their ventures arises too. Success now requires doing the right projects, not just doing the projects right. As they say, there’s no right way to do the wrong thing. Oracle’s Primavera Portfolio Management solution focuses on the value of each live or proposed project and thus provide a greater understanding of what projects or programs are over or under budget. It has out-of-the-box integration ability with Primavera P6 Project Management and Microsoft Project Server, including consolidation across multiple servers. Primaveraprovides a set of integration tools that allow it to synchronise with other applications. The link with those applications can remain live so that changes to one remain automatically synchronised with the other. Clarizen,a cloud-hosted application, requires little more of your IT resources than an internet connection. It is a recognized leader of portfolio management tools that harnesses the effectiveness of social media into organizing your team. It is cross-platform functional and supports multiple languages and currencies. Clarizencombines work management and team collaboration with real-time business execution by allowing stakeholderinput as well. Genius Project is another portfolio management tool that is highly respected in the industry.Like Clarizen, it is also a cloud-hosted solution.It supports a variety of deployment options, making it flexible enough to fit the needs ofalmost any organization. It can generate up to five hundred reports, has traditional workflow tools, and incorporates modern enterprise social media tools. Oneof the outstanding benefits of this tool is that it is easy to learn without sacrificing functionality. While an endless list of portfolio management tools is available, there is no single tool that is best for every organization. Available tools differ largely in what they do and how well they perform. The right tool depends on the organization itself—their business practices, needs, and the nature of projects they manage. Today, governments at every level around the globe face challenges asnever before. Increased services to citizens, financial pressures, and fulfilment of political commitments all require more efficient and transparent governance. While prioritization and portfolio management in the government and the public sector is a daunting and complex task, it is becoming essential to implement good portfolio management and governance practices to stay on track and deliver the best value in public services. Many public sector organizations have an inadequate grasp of the strategic nature of portfolio management versus the day to day concerns of individual projects. Skilful portfolio management can help align projects with governmental strategic visions. Every addition, accomplishment, or failure changes and shifts the delicate and elusive balance between risk and opportunity. To maintain control and succeed,organizations need to organize struggling projects and align business strategies with organizational policies, business owners, investors, stakeholders, executives, and governmental bodies. This complex task requireseffectiveportfolio management that, in turbulent times, not only delivers required critical edge but also allows them to improve, identify, and derive greater values from project investments.